Whether its education, just plain fun, or a little of both, Galey Farms is the perfect venue. Pick a package that best suits your needs and let us do the rest. Learning about a prominent local farm and how it contributes to its community has never been easier or more entertaining! 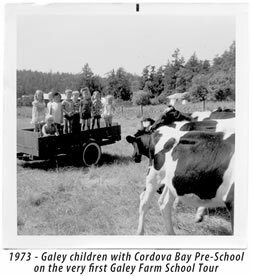 Galeys Farms is a responsible member of its community. As such, we accept and will deliver non-perishable food items for the Mustard Seed Food Bank. We have a large weatherproof tent for our holding area and eating, the train cars and hay wagon are covered, the petting farm and corn maze are fully drained with bark mulch trails. Still, it's always a good idea to dress for sun, rain, cold or other potential weather conditions. So, Teachers… Students… Parents…here's your chance to get back on the farm! 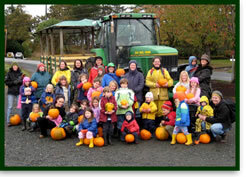 Galey Farms is offering school programs for Kindergarten to Grade 12! You can wind your way through their a-maze-ing corn maze, go on a hay ride and wander the pumpkin patch, visit the petting zoo and learn about farming practices including, what integrated pest management is and why it is so important! You'll also learn why the Blenkinsop Creek project plays such an important role in farming practices. So come out to the farm… learn where your food comes from, get lost in a-maze and have a whole lot of fun! These packages and pricing are for school groups and day cares only!! One Small Bin Pumpkin per person. Galey Farms stands behind all community organizations and is proud to offer this exclusive opportunity to our community! Open to all non-profit organizations, including schools, sport teams, scouts, girl guides and youth organizations. Sell tickets at your school or organization and Galey Farms will donate 25% of these sales to your organization. A specific date will be set for your event at the farm and will include front of the line passes for your patrons.